If what you're after in a pair of earphones is something that sounds really high quality, but in a package that doesn't cost you hundreds, the B400 by Brainwavz is an easy recommendation. They look cool, they're comfy and they sound fantastic. Brainwavz may not be a brand you're all that familiar with, but if you're looking for a pair of affordable earphones that offer you the best sound possible for the money, it's a savvy choice indeed (as we found out with our first pair, the B200, last year). The most recent pair we've received for review is the B400. These balanced armature in-ears promise to pick up on the B200's strong performance and carry it through 2018 in style. With its 3D-printed housing, Comply foam tips and quad driver system, this in-ear product certainly impresses for its £135 asking price. One of the cool things about B400's design is that they're 3D printed. Each half of each earphone's side housing is printed in one go, the internal components placed inside, then the other half stuck on top to seal it all in place. There are both positives and negatives to 3D printing, though. On the upside, it means there's very little waste material when the earphones are manufactured, so it's cheaper, while offering great flexibility in design. On the downside, the end of the protruding part that holds your ear tip is a little uneven; it doesn't affect comfort at all, and it's not something you'll notice unless you take off the eartip, but it's there. Still, the housing is curved and sculpted in a way that makes it ergonomic and comfortable to wear. Similarly, the generous number of tips provided (six silicone sets) means it's virtually impossible not to find a fit that'll work for you. There's also a pair of Comply memory foam tips in the box. The joy of these tips is that you can squish them down to virtually nothing, insert them into your ear canals and they fill up the space to provide a comfortable yet snug fit. The plastic earphone housing is available in five different colours too. We tried the the transparent model, which reveals the components inside. For those who want more opaque colours there's also black, blue, red and a glittery, shimmery "Cosmic Black". Only one pretentious name, good job. It's worth noting that the B400 is wired using a 3.5mm jack, so if you have a smartphone without an output jack, you'll need an adapter to get it plugged into your device. Being wired also means you never have to worry about Bluetooth connection quality, or worry about needing to charge the earphones. As wired designs go, the Brainwavz are pretty versatile thanks to being equipped with MMCX connectors. This means the earphones are detachable, and you can go shopping for your own cable if you want to - although you shouldn't necessarily need to as there are two cables in the box (one with an inline microphone). We wouldn't recommend using the non-phone cable for use with a smartphone as it's is slightly too short, but it's the perfect length to use with a wireless monitor pack fixed to your belt. While all this is great, the one element of the cable that will divide opinion is the mouldable section that leads out of the plastic housing and over the top of the ear. Some people love these, since it gives a more secure fit and means there's less tugging downwards on the ear. Others hate it. It certainly makes initially putting the B400 on a little more cumbersome than just putting an ear tip in your ear. Once in place though, the fit is comfortable and we didn't experience any tugging sensation. Brainwavz has used what it calls Quad Balanced Armature drivers, which means there are four drivers in each earbud of the B400, with each driver designed to tackle its own range of sound. In real life, that means each part of the tonal range sounds good, no messing around. Bass, mids and treble are all balanced and clear, without any huge shift towards any particular element. These are neither too bassy or too treble-heavy, and for the audiophile, that's brilliant. In fact, even for the layperson, the sound will be enjoyable. To be critical we'd say there needs to be a touch more bass, but that's our own preference. It would make the B400 a little more immersive and warm, but still, there's plenty to like about them. They're loud, surprisingly so, and with the audio signal being such high quality you can hear details in every section of the spectrum. We tested the B400 both just for regular listening, and plugged into in-ear monitor packs during live performing, and these in-ears are adept at both. The clarity and quality of the audio meant that during loud performances we weren't struggling to hear audio cues, and there was no break-up or distortion to contend with. Granted, that's a niche use case, but the B400 impressed us for this use nonetheless. If what you're after in a pair of earphones is something that sounds really high quality, but in a package that doesn't cost you heaps, the B400 by Brainwavz is an easy recommendation. They look great, they're comfy, and most importantly they sound fantastic. Being wired has its limits - especially in an era when smartphone makers are moving away from the 3.5mm jack - but it equally has its own benefits. Not having to charge a battery, ever, is one of those. What's more, a wired connection is always going to be more reliable the Bluetooth, no matter how good the Bluetooth is. What really makes the Brainwavz B400 shine, though, is their affordable price point. If these cost £50 more then we'd still recommend them. They're fantastic value for money. The Brainwavz B200 offer a comfortable and secure fit, along with well-balanced sound quality. As an upgrade to your current phone-bundled earphones, we can think of no better affordable in-ear option. The B400 promise more, but you'll need to pay more too. 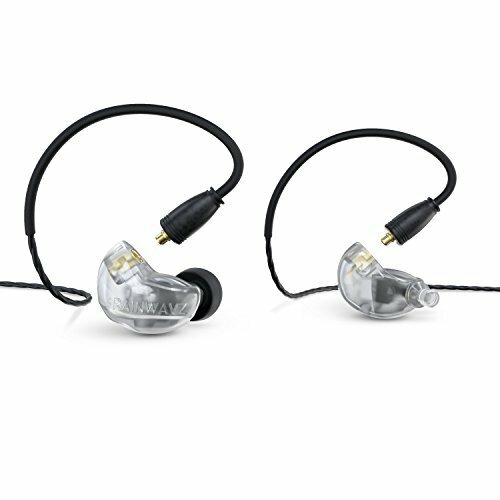 The Audio Technica ATH-LS70iS in-ear monitors are a great companion for live music stored on your mobile device. They're a dab hand with regular music too, although some may not appreciate the added sense of space from the 3D processing. Denon has produced a seriously good pair of in-ear headphones that don't cost the earth. For £79 they offer a serious upgrade to the headphones you'd get supplied with your phone as they can pick out nuances in songs that you wouldn't typically be able to hear.